Wednesday, June 18th, 2014. 9-10 am Alaska Time; 10-11 am Pacific, 1-2 pm Eastern Time. More than three years after the Fukushima Dai-ichi nuclear power plant accident in Japan, questions remain about how much radioactive material has been released and how widely and quickly it is dispersing across the Pacific Ocean. Scientists at the Woods Hole Oceanographic Institution (WHOI) are partnering with coastal communities from southern California to Alaska to collect seawater samples and raise funds for analyses that provide the latest information about radiation levels in the ocean. Join Ken Buesseler, marine chemist and director of the Center for Marine and Environmental Radioactivity at WHOI for an update on what is known about radioactivity levels in the Pacific Ocean and to learn more about the unique collaboration between concerned citizens and scientists and how Alaskans can get involved. This call is presented by ACAT’s Alaska Collaborative on Health and the Environment (CHE-Alaska). Ken Buesseler, director of the Center for Marine and Environmental Radioactivity at the Woods Hole Oceanographic Institution (WHOI) in Massachusetts where he specializes as a senior scientist in the study of natural and manmade radioactive isotopes in the ocean. 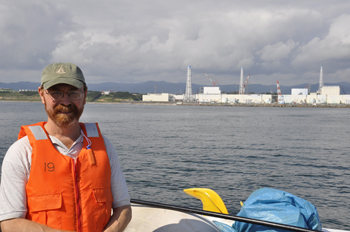 Buesseler began sampling and analyzing seawater surrounding the Fukushima Dai-ichi nuclear power plant three months after the disaster. In January 2014, he launched a crowd sourcing campaign and citizen science website to collect and analyze seawater along the West Coast of North America as the radioactive plume travels 5,000 miles across the Pacific Ocean. All of the data is being published on the website, How Radioactive is Our Ocean? Dr. Buesseler will give a series of public talks on the West Coast in California, Oregon, and Canada from May 27-June 5, 2014. Here is the schedule of events. May 19 Guest on WCAI’s Living Lab at 9 a.m. and 7 p.m.
May 27 Presenting Fukushima: A View from the Ocean at the University of California at Santa Barbara, Campbell Hall at 7 p.m.
May 31 Presenting Citizen Science: Monitoring Fukushima Radiation at Santa Rosa Junior College’s Petaluma campus, Carole Ellis Auditorium at 7 p.m. with Dan Sythe, CEO International Medcom. Sponsored by the SRJC Chemistry Dept. and Physics Program. June 2 Our Radioactive Oceans music, silent auction, and talk at The Refuge in Portland, Oregon from 5:30-9 p.m. $5-$10 donation at the door. No one will be turned away for lack of funds. June 5 Presenting Fukushima: A View from the Ocean at the Vancouver Aquarium at 9 a.m. in Vancouver, Canada. June 5 Presenting Fukushima: A View from the Ocean at St. Anne’s Academy Auditorium at 7 p.m. in Victoria, Canada. Please join us for a discussion with national experts, with a teleconference call on May 28th, and at events in Anchorage on June 4th, and on Thursday, June 5th in Bethel, Fairbanks, and Homer. Join our CHE-Alaska listserve send an email to info@akaction.org to be notified of upcoming teleconference seminar topics and speakers and to receive environmental health bulletins. Check out ACAT’s calendar for upcoming events! Over 60 past CHE-Alaska Calls are now available as podcasts.